This spring, I got into seed starting. I don’t sow seeds often really, I generally go for liner or starter plants, but this year it just kind of happened because I had more growing room to do so. Comstock Ferre in Old Wethersfield, Connecticut is a great place to get various seeds. One afternoon, I decided to go browse their amazing selection. If you haven’t been there yet – they have loads of various seeds in big wooden displays – it kind of feels like a candy store as you look thru each tray or drawer. Of course, I had to go for the unusual plants. I purchased seeds for a climbing spinach for example which sold out at the market this season because it was interesting. It is called Malabar. I also got various types of lettuce seeds and seeds for unusual plants like giant castor beans. 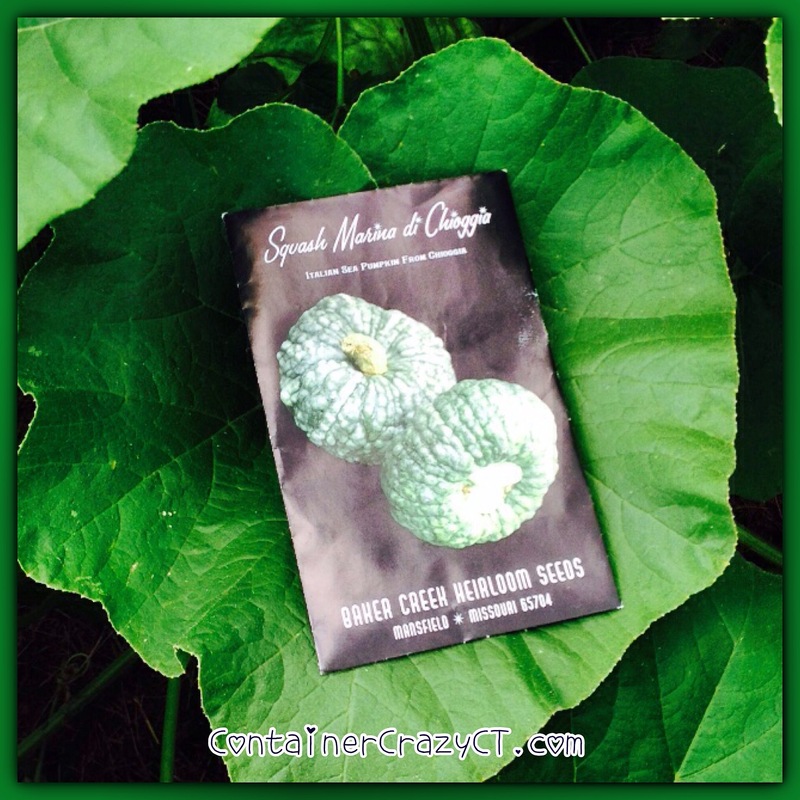 One particular seed packet which caught my attention were seeds of Italian sea pumpkins from Chioggia (Squash Marina di Chioggia). The seed packet is labeled by Baker Creek Heirloom Seeds from Mansfield, Missiouri. 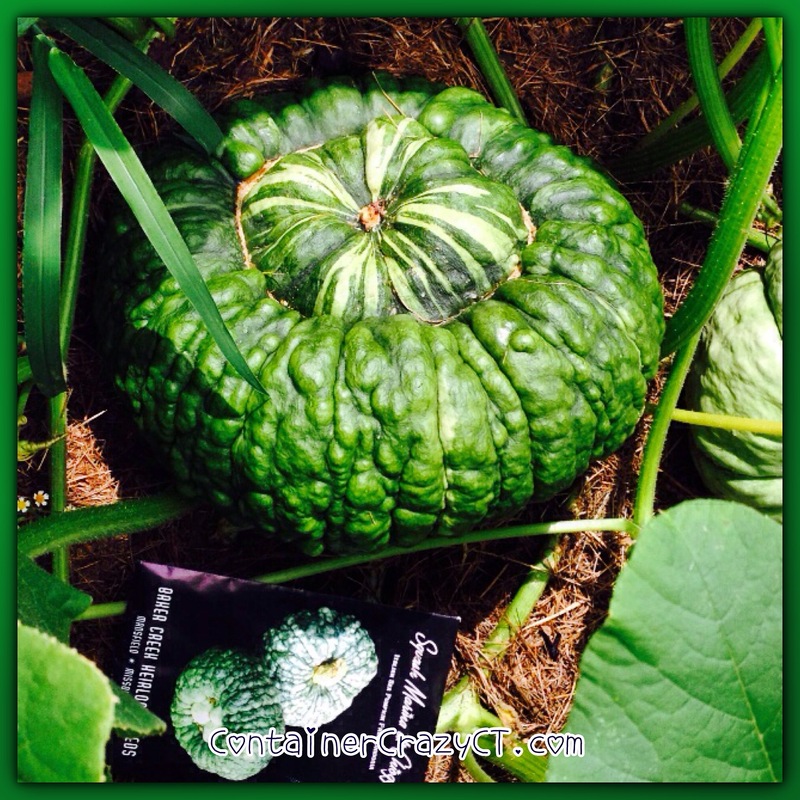 The pumpkins are a blue-ish color and shaped like turbans, so I thought – cool, I want to try these. My attempt of growing them in containers failed.The pots were not large enough, the soil dried out too fast, and the animals visiting my deck ate all the flowers! But before the hungry critters munched on them, I enjoyed the plant’s bright vivid yellow flowers very much, and so did the bees. One plant was situated near some blue flowering Plumbago trailing from another patio pot. 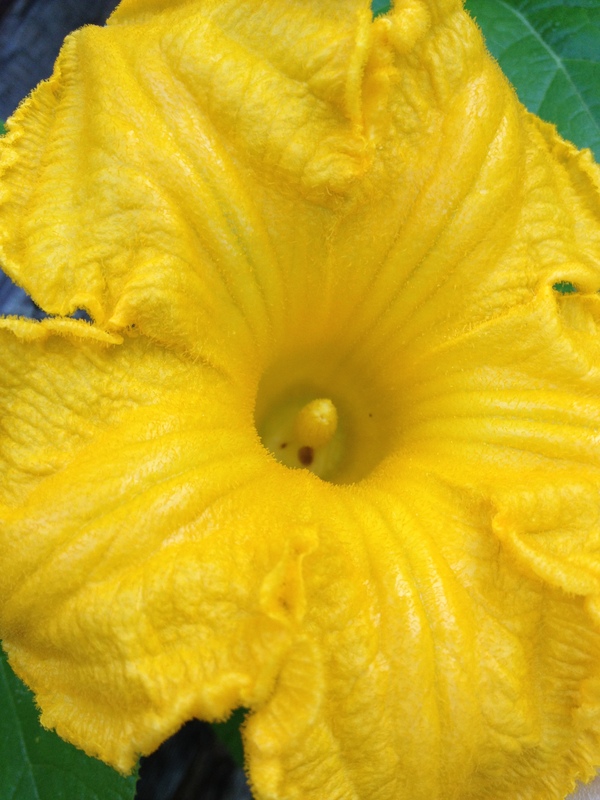 The blue flowers next to the yellow pumpkin blooms were bright and pretty. 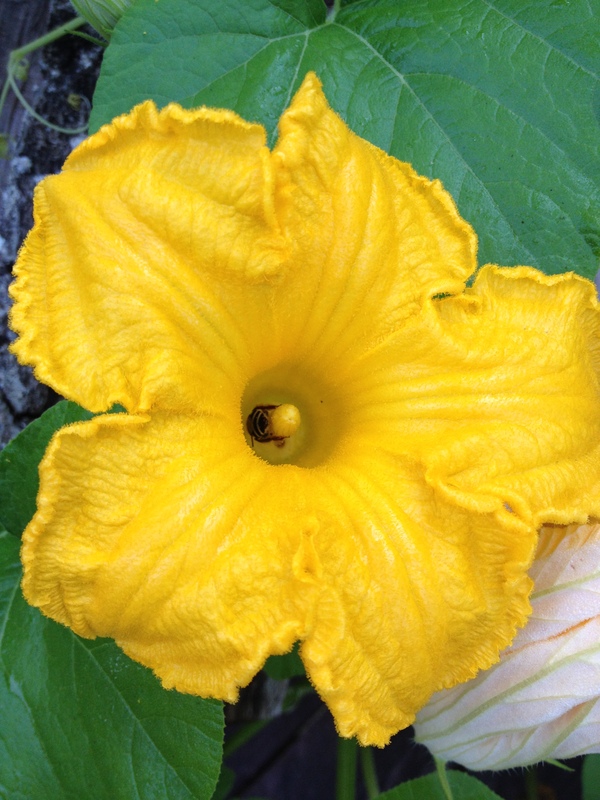 Flowers of pumpkins and gourds – so vivid and bright yellow – a delight for my eyes! 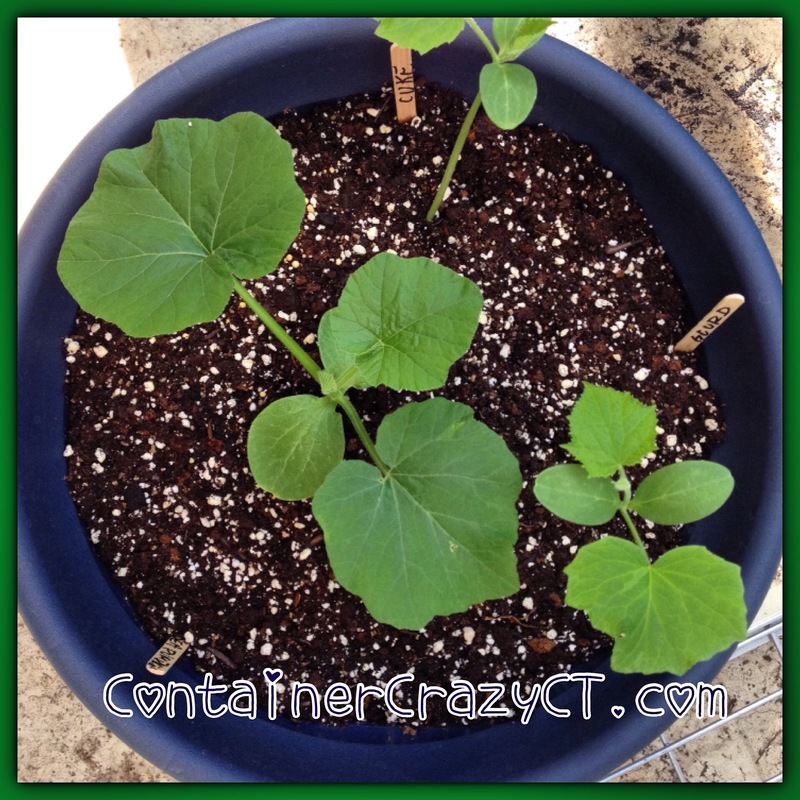 By mid-summer, the pumpkin plants in my patio pots got powdery mildew on the foliage – so later, after it was getting worse, I decided to cut them all down and give up growing them in my patio pots. Luckily, I had also given two seedlings plants to my Dad in early June from my success of growing them from seeds. He has an exceptional vegetable garden and I told him about the pumpkins and asked he grow a few in his gardening space. 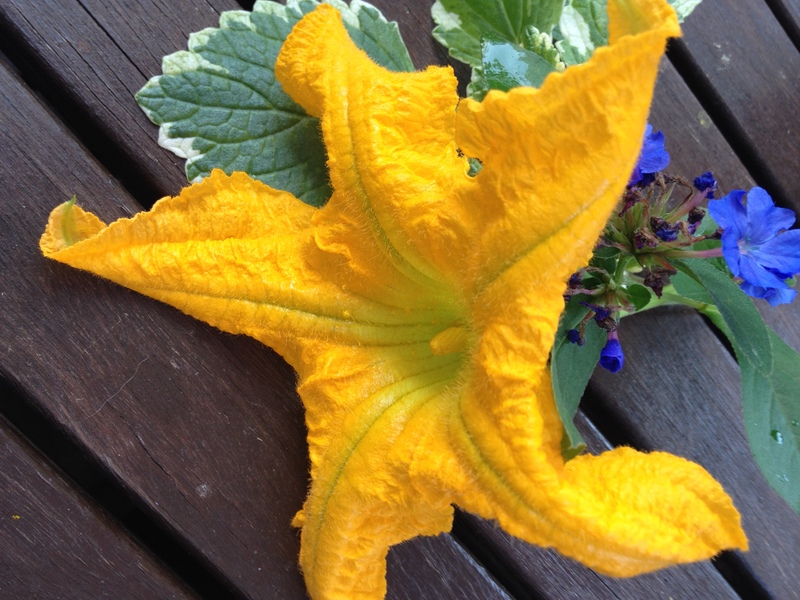 He said he would take only two seedlings because they take up a lot of space in the garden, which most people know – pumpkin and squash vines spread. This month, he and my Mom took me to their garden on separate occasions to see two of the sea pumpkins which started growing and are hidden below the large leaves on one plant. It took a little while to locate them. I think they are BEAUTIFUL. 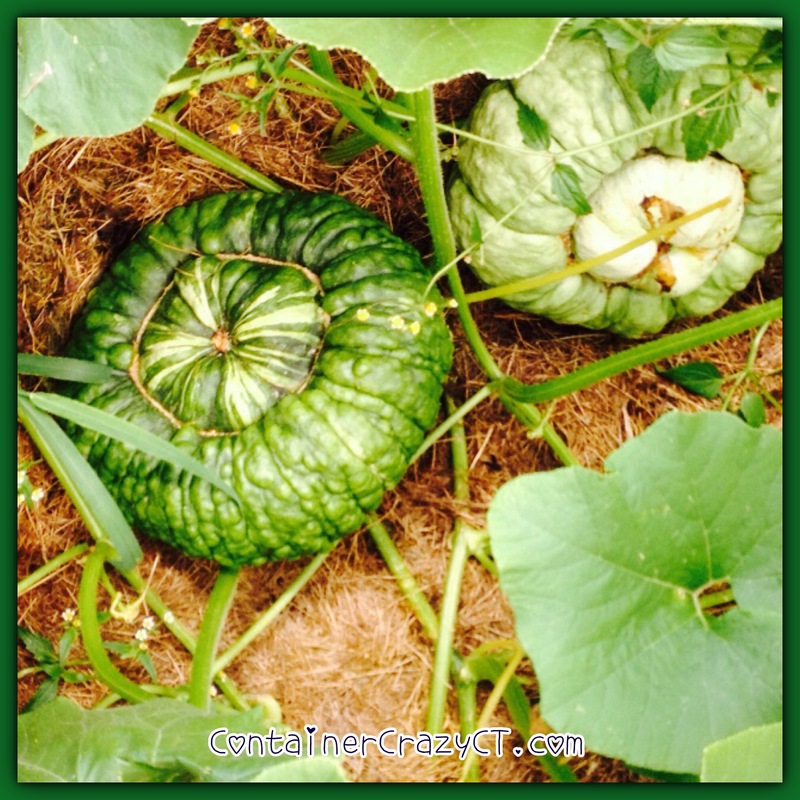 One is especially pretty with a center pattern, and the other is a lighter green color. This whole process made me think how I could never master a big vegetable garden like my Dad does (because I’m too lazy and prefer gardening in containers and patio pots), but how I loved growing plants from seed and sharing them with him to grow in his garden. 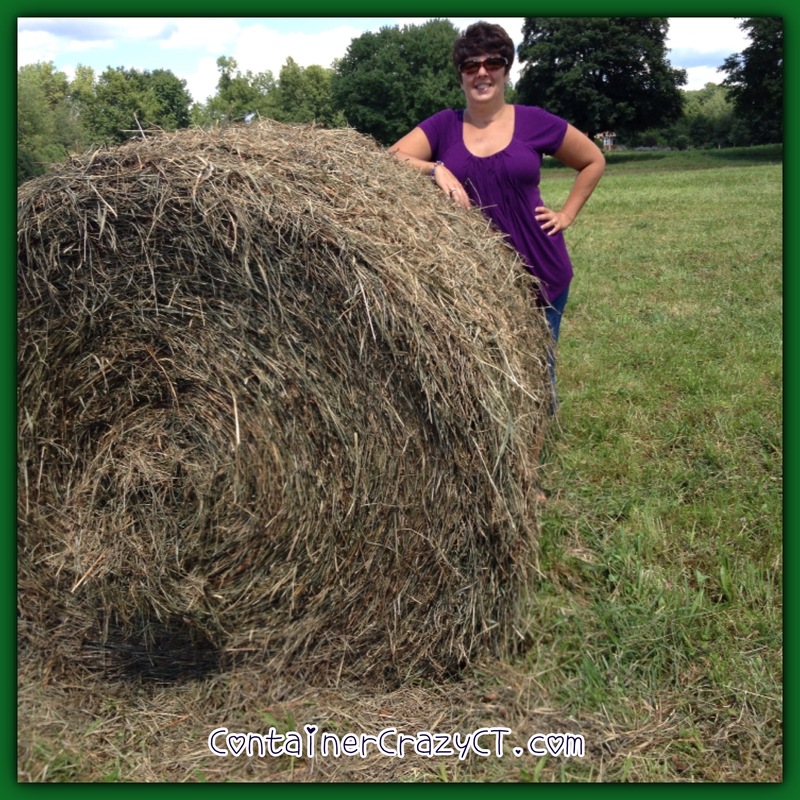 In fact, growing plants to share, sell, or put in containers is truly my passion, well, if you know me, you know this. 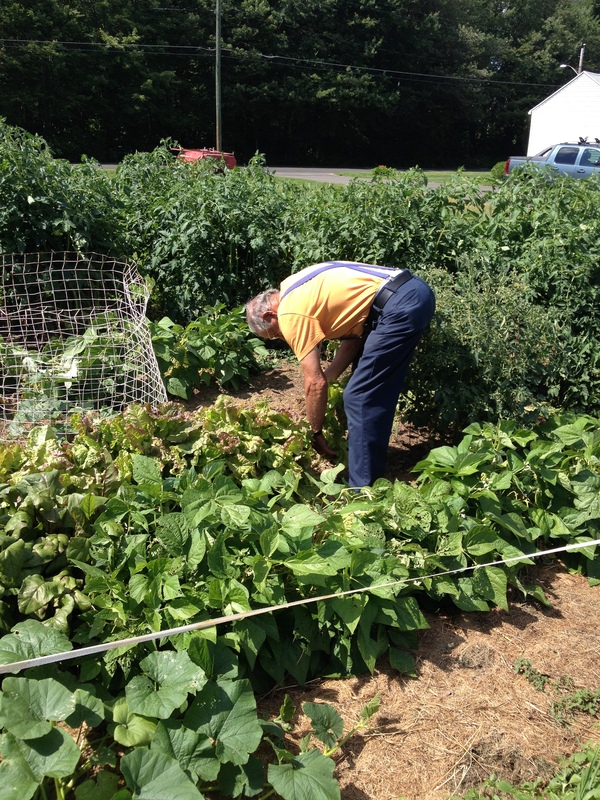 Bert, my Dad, in the garden getting some fresh goodies for me. We never lacked fresh food in summers when we were growing up. And because I live only a few miles from my parent’s home, I have the pleasure of seeing them routinely when they quickly come by my house to drop off some tomatoes, blueberries, zucchini, cucumbers, etc from Dad’s garden. This is truly a blessing. Each and every time I bite into a fresh tomatoe from a garden, it flushes warm feelings of my Dad’s tomatoes and his love of growing them into my soul. My Mom told me I could have the two sea pumpkins growing when they are ready – which kind of surprised me cause she likes them too. My brother, who lives next door, asked me what type of pumpkin they are as well and if they are good for eating and baking. He’s admiring them also. This week my Mom called me to say the pumpkin (the especially pretty one) has gone missing. My reply was she must be having trouble spotting it because of all the foliage. When I saw my Dad a day later, I asked him if the pumpkin is really missing, and he replied that he couldn’t find it either. Geesh, I thought – “Who would take that pumpkin? !” Seriously. An animal couldn’t have dragged it away, it is getting rather large now. I texted Jimmy, my brother, that evening. He texted back that he would check for me. He grows some of his vegetable plants in Dad’s garden too, so he is out there daily when harvesting his peppers. He was able to locate the sea pumpkins and said if they had gone missing, he wouldn’t know who took them. I was relieved he found them, and excited to hear from Jimmy the vines grew another ten feet. As my Dad noted to me earlier in the season, pumpkins take up a lot of space. His plants are growing healthy and strong. 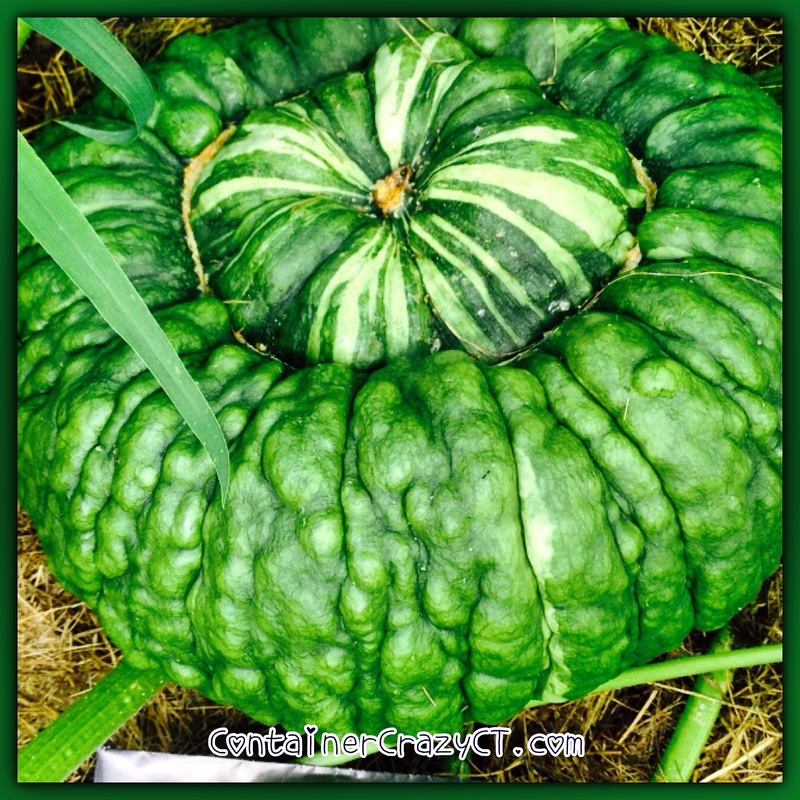 This pumpkin is noted on the seed packet label as one of the most beautiful and unique of all squash and “a perfect variety for market gardeners.” And it is edible, but I think I will be keeping them for display as part of my autumn decorations. The fruit will weight about 10 lbs each when they are ready. By the way, my father said there are plenty more flowers on the two plants, so there should be plenty more pumpkins coming – so long as they don’t go missing again.